Tanzanian Bank M finally enters Kenya, CBK approved. Kenyan commercial banks' regulator, Central Bank of Kenya(CBK) has finally today, approved a license request by Tanzanian Corporate lender,Bank M to operate in the country.The move by Bank M to enter the kenya banking sector was as a result of a 51per cent equity shareholding valued at kes1.3bn that the lender acquired early this year from Oriental Commercial Bank of Kenya. According to the kenyan business laws,the coming together of the two banks,Oriental and Bank M, will have to register a new name predicted as M Oriental Holdings Limited .In other words, Kenya's Oriental Commercial Bank is now M Oriental Commercial Bank of Kenya. 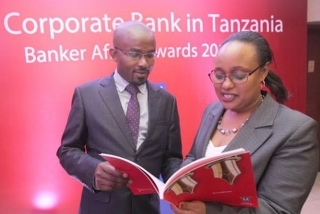 Bank M is an award winning Tanzanian corporate bank with higher affinity on family owned businesses. According to the bank's management, there are a lot of preparations to be done that will take up to September to become fully operational in kenya. This is history made.For the first time ,a Tanzanian lender has entered kenya,a top economy in East and Central Africa.Bank M remains the first financial institution from neighbouring Tanzania to be licensed to operate in the country,Kenya.